Germany natives Fridtjof Detzner and Christian Springub learned to code practically before they learned to drive—and it’s a skill that served them well as teenagers, when they began building websites for individuals and businesses. From there, it dawned on them: Why not figure out a way for clients to update and create sites themselves, minus the next-to-impossible coding part? Together with their friend Matthias Henze, they got to work in a barn on Detzner’s parents’ farm. And in 2007, Jimdo was born. Jimdo has two products, Jimdo Dolphin and Creator. With Creator, customers can choose from ready-made templates and take advantage of drag-and-drop functionality. You can add products for an e-commerce shop, choose a blog function or integrate Jimdo’s new live-chat app to make connecting with customers even easier. Don’t want to DIY at all? Jimdo Dolphin is an AI-driven website builder that can whip up a site in mere minutes by asking some questions, sourcing information from Google, and linking to social media accounts. It can pull information you have from different places, like your social media text, photos, logo, business hours. Then the AI system combines it all into a new website that’s ready to go. If you don’t have any content, they create it for you based on your answers. The structure, text, design, and all the extras you might need for your particular business are all set, and then you can change things around as you like. Once you’re online, Dolphin continues to help you out with SEO tasks and giving you tips to improve. So it’s not just about making a beautiful website but also about making it successful and useful for your business. A key part of the company’s success is how much it values feedback from its community. It’s common for customers to receive surveys and get invited to meet-ups—and they are even invited to stop by the Hamburg headquarters for in-person support. According to Benkert, “We are stepping out of our comfort zone regularly to see the products that we built from the other side.” And the information they receive, he says, helps them “make the product even more accessible to the developers. Maybe we need to add another feature, or maybe we need to make it easier to use.” Jimdo stays connected to its users in other ways—namely through its 8 Days blog, which runs articles for entrepreneurs on topics such as starting and growing a business and building an effective website. Hiring the right team members has also been crucial. “One thing we look for in everybody we hire is the will to learn new things,” Seiffert says. 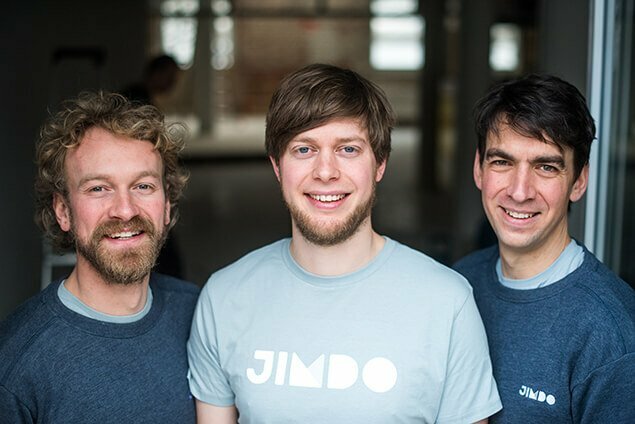 “The curiosity to learn, combined with a fearlessness to actually approach new topics, is most important when hiring engineers.” And today, with its 200 employees split between offices in Hamburg and Tokyo, it’s safe to say that Jimdo has come a long way from its start in a farmhouse in northern Germany.